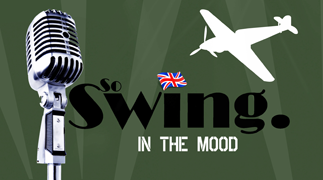 ‘So Swing – In the Mood’ a nostalgic cabaret celebrating the music of the Thirties, Forties - and all things British! This show takes you on a journey back to Wartime Britain, with the every popular Glenn Miller and Vera Lynn classics; heads to Lambeth for a Cockney Singalong, and features much loved songs from great British Musicals. The rousing finale is a patriotic rendition of ‘Land of Hope and Glory’. Songsheets and Union Jack flags are provided for your guests. Our ‘So Swing – In the Mood’ performers are charismatic and witty, ensuring audiences really get into the ‘Blitz’ spirit. Songs include: Lambeth Walk, Consider Yourself, We’ll Meet Again, White Cliffs of Dover, In the Mood and many more! The show can be performed as a two piece, (one male, one female) or three piece, (two males, one female), to fully engineered backing track or accompanied by the fabulous So Swing trio.
" 'SO SWING - In the Mood' is the perfect choice to recreate the war era - we wouldn’t hesitate to recommend their splendid show!"